Icimo is on a mission to empower organizations to leverage their most valuable assets – data and people. 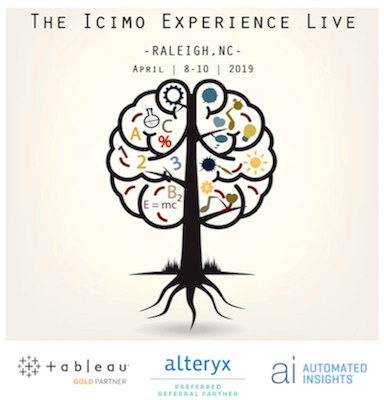 Elevate your analytics impact by joining us for the Icimo Experience Live – Conference. We’re joining together the most analytical and innovative minds to learn new approaches to using Tableau and Alteryx, fuel data inspiration and collaborate with industry-like data enthusiasts! 2 days, 3 keynotes, 3 knowledge pathways and 9 sessions to choose from! Plus, join us for a night out-on-the-town for Icimo LIVE!